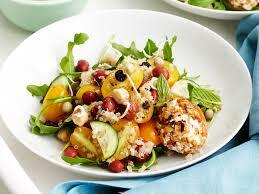 Goat Cheese and Quinoa Salad…..
Warmer weather is on the way and with it the start to lighter meal ideas. Enjoy!!! Combine quinoa and water in a large saucepan. Bring to the boil on high and cook for 5 minutes. Reduce to low heat and simmer, covered for 15 minutes until grains are tender. Set aside for 5 minutes. Fluff with a fork and transfer to a large mixing bowl. In a bowl combine nuts. Roll heaped teaspoonfuls of cheese into flattened patties and coat in nuts. Chill until firm. Dressing: In a jug, whisk all ingredients together. Season to taste. In a serving bowl, toss together rocket, beans, tomatoes, cucumber and currants with quinoa. Heat oil in a small frying pan on medium. Fry patties for a few seconds each side until golden. Drain on paper towel and add to salad. Finish with sprout, mint and drizzle of dressing.